Eden, a young boy of 3 years old, was just diagnosed with speech delay. This is one more illness that is affecting him. He also suffers from immune deficiency and deafness. All are related to his first year of life when he has faced severe chronic malnutrition. He looks normal, but the consequences are detrimental; this lack of food (hunger), at a critical moment in his early life, will hamper his ability to learn and hinder opportunities later in life. This disturbing story may be the intolerable reality of children living in India or Ethiopia; but in fact, this story happens next door to us in America. Eden is one among other protagonists of a provoking documentary launched last month – A Place at the Table. This documentary is thought-provoking mainly because it shows us that obesity and hunger are neighbours, our neighbours. Access to affordable nutritious foods in a world of plenty seems an unacceptable challenge for too many. In fact, this is increasingly the reality for many children living in both the developing and developed world, mainly because hunger and obesity are globally interconnected. We cannot pretend that it is not visible; it is in fact in our backyard. The burden of malnutrition is one major challenge in the context of the post-MDGs if we really want to achieve sustainable human development for every child in the world. It is true that we have made significant progress over the past 50 years in the sector of population health. Life expectancies for men and women have increased. A greater proportion of deaths are taking place among people older than 70 years. The burdens of HIV and malaria are falling. Far fewer children younger than five years are dying. But this encouraging picture is being challenged by old and new threats. Africa remains the most afflicted continent, where maternal, newborn, and child mortality, along with a broad array of vaccine-preventable and other communicable diseases, are still urgent concerns. Malnutrition and stunting continue to be a long-term damaging stigma for children in Africa and South East Asia, with an estimated 75% of the world’s 165 million stunted children living there. The link to extreme poverty is incontestable – as children in the poorest communities are more than twice as likely to be stunted, particularly in rural areas where as many as one third of children are affected. On the other hand, more young and middle-aged adults in low and middle-income countries are suffering from obesity and diet-related non-communicable diseases (diabetes, hypertension, stoke and cardiovascular disease…). These diseases are driven primarily by phenotypic predisposition and high consumption of ultra-processed foods. With increasing urbanization and shifts in diet and lifestyle, the result could be an escalating epidemic of such conditions in many low- and middle-income countries. This would create new economic and social challenges, especially among vulnerable groups. Fighting stunting is the emerging battle in the context of optimal human development. It is the irreversible impact of not receiving enough nutrient dense foods within the first 1000 days of life, from pregnancy to a child’s second birthday. But stunting is more than a problem of stature; this lack of nutritious food also impacts the overall physical (organ as well as immune cell function) and cognitive development, and determines the susceptibility to obesity and food-related non communicable diseases later in life. During the first 1000 days, nutritional requirements to support rapid growth and development are very high, and the baby is totally dependent on others for nutrition, care and social interactions. For example, the first year of life is a time of astonishing change during which babies in normal conditions, on average, grow 55% in length, triple their birth weights and increase head circumference by 40%. Between 1 and 2 years age, an average child grows about 12 cm in length and gains about 3.5 kg in weight. During these crucial days as well as during fetal life, the body is putting together the fundamental human machinery (similar to hardware and software for computer). This process is done over a very short period of time and requires specific nutrients like vitamin A, iron, folic acid, zinc but also protein, long-chain polyunsaturated fatty acids and choline. The immune-system and brain-synapse development are particularly vulnerable. As a result, any disturbance of this frantic activity leaves a terrible mark. Smaller than their non-stunted peers, stunted children are more susceptible to sickness. In school, they often fall behind in class. They enter adulthood more likely to become overweight and more prone to non-communicable diseases. When they start work, they often earn less than their non-stunted co-workers. The drama of this situation is the fact that an undernourished mother is more likely to give birth to a stunted child, perpetuating a vicious cycle of high prevalence of premature death (an estimated 60-80% of neonatal deaths occur among low birth weight babies), undernutrition and poverty. It is imperative to focus on the first 1000 days of a child’s life as the crucial window of opportunity for change. It is during this time that proper nutrition has the greatest impact on a child’s health and potential future wellbeing and opportunities. A recent publication in Lancet has reinforced this idea, and has showed that attaining optimal growth before 24 months of age is desirable; becoming stunted but then gaining weight disproportionately after 24 months is likely to increase the risk of becoming overweight and developing other health problems. UNICEF’s latest publication “Improving Child Nutrition: The achievable imperative for global progress” is closing the loop. It shows that there are proven low cost solutions for reducing stunting and other forms of undernutrition. These simple and proven nutrition activities need to be integrated together. They include improving women’s nutrition, early and exclusive breastfeeding, providing additional vitamins and minerals as well as giving appropriate nutrient dense foods, especially in pregnancy and the first two years of a child’s life. Investing in children’s and women’s nutrition is not only the right thing to do from a human right point of view; it is also a cost-effective investment. It can increase a country’s gross domestic product (GDP) by at least 2-3% annually. Every US$1 spent on nutrition activities to reduce stunting will have a return on investment of US$30. This integrated nutritional strategy as proposed by UNICEF and other international stakeholders is the locomotive that can accelerate economic growth and pull millions of people out of poverty. Let’s work all together to be sure that every children around the world has a place at the table. This is our responsibility! Although the number of undernourished people worldwide has decreased since 2009, nearly 1 billion people go to bed hungry each night. In fact, malnutrition contributes to the death of half a billion children under age 5 every year. In Africa alone, one child dies every six seconds from hunger. One good initiative is the home-grown school feeding (HGSF – World Food Program) that works to alleviate hunger and poverty. HGSF programs connect local producers with schools, helping to provide children with nutritious and fresh food while providing farmers with a stable source of income. Roughly 1.3 billion tons of food – a third of the total food produced for human consumption – is lost or wasted each year. Within the USA, food retailers, services, and households waste approximately 40 million tons of food each year – an amount that has been estimated to be enough to feed the close to 1 billion hungry people. In Canada, $27 million in food is wasted each year. “This wasted food represents approximately 40% of all the food produced in Canada (http://www.homemakers.com/blog/ecologic/2011/01/25/food-how-not-to-waste-it/). In England, about 1/3 of food purchased in the UK is thrown out every year. This equates to £10bn (about CDN$19.5 billion) (http://www.worldvision.ca/Education-and-Justice/advocacy-in-action/Pages/what-a-waste-the-food-we-throw-away.aspx). Between 25-40% of most fruit and vegetable crops are in fact rejected by Western supermarkets. One British supermarket insists that all carrots be perfectly straight—“so customers can peel the full length in one easy stroke,” a store manager explained to Tristram Stuart, author of a new book, Waste: Uncovering the Global Food Scandal. Supermarket waste is just one part of a colossal and growing environmental problem: food waste. Consumers share the blame. Food production in the West has changed more the past 50 years than in the previous 10,000. The agricultural industry can now produce unlimited quantities of meat and grains at remarkably low prices, creating an abundance of food and profits. Consumers, lulled by cheap prices, are unaware of the hidden costs of this means of production, or the staggering waste involved in stocking the supermarkets (http://www2.macleans.ca/2009/11/09/what-a-waste/). Thankfully, organizations around the world are working to educate people on the importance of preserving food or collect surplus food from food providers and distribute it to shelters and other agencies. A great sustainable initiative! In sub Sahara Africa, some projects teach farmers to use the power of the sun to dehydrate fruits. Experts estimate that, with nearly all of their moisture removed, the fruits’ nutrients are retained for up to six months, allowing farmers to save the 100,000 tons of mangoes alone that go to waste each year. Nearly 1 billion people suffer from micronutrient deficiencies, including lack of vitamin A, iron, and iodine. Between a one quarter of a billion to half a billion children with vitamin A deficiencies become blind every year, and 1/2 of these children die within 12 months of losing their sight. These problems could be fixed by ensuring access to nutritious foods. Organizations such as AVRDC – The World Vegetable Center and the Developing Innovations in School cultivation (Project DISC) have been working to combat this problem. AVRDC works to expand the vegetable farming sector across sub-Saharan Africa, increasing access to nutrient-rich crops. Developing Innovations in School Cultivation, Project DISC, educates youth in Uganda on the importance of agriculture and nutritious diets. Students in the program learn about vegetables and fruits indigenous to their communities, as well as how to process and prepare these foods for consumption. Lack of access to healthy food does not only result in hunger. More than 1 billion people around the world are overweight. Of these, nearly half are obese. And nearly 43 million children under the age of five were considered overweight in 2010. Surging international rates of heart disease, stroke, diabetes, and arthritis are being attributed to unhealthy diets, and 2.8 million adults die each year as a result of being overweight or obese. UN Special Rapporteur on the Right to Food Olivier De Schutter has urged countries around the world to make firm commitments to improving their food systems. In Mexico, where 19 million are food insecure and 69.5% of the country is overweight or obese, De Schutter has called for a “state of emergency” to tackle the problem. He attributes the hunger-obesity combination to the county’s mono-cropping and export-led agriculture and argues that a change to agricultural policies could tackle these two problems simultaneously. More than three quarters of a billion people – 793.1 million adults – are illiterate. Although the number of people unable to read has decreased from 1 billion in 1990, illiteracy prevents millions of people from moving out of poverty. For farmers, being illiterate can limit access to information such as market prices, weather predictions, or training to improve their production. But there are innovative solutions! Scientific Animations Without Borders, was developed by a team of researchers to educate illiterate farmers across the world. Farmers are able to view educational training on how to create natural pesticides or prevent crop damage using solar treatments through the use of short animated videos accessible on mobile phones. In India, farmers can receive daily updates via text or voicemail on weather and crop prices through subscription services set up by major telephone companies. Kheti, a system operated by the Sheffield Hallam University in the UK, even allows farmers to take pictures of problems they are having with their crops and send them in for advice. With more than 4.6 billion mobile phone subscriptions globally, projects such as these have the potential to reach and improve the lives of many around the world. This article first appeared at Nourishing the Planet, a blog published by the Worldwatch Institute and also by the Monitor (http://www.csmonitor.com/World/Making-a-difference/Change-Agent/2011/1226/One-billion-holiday-wishes). 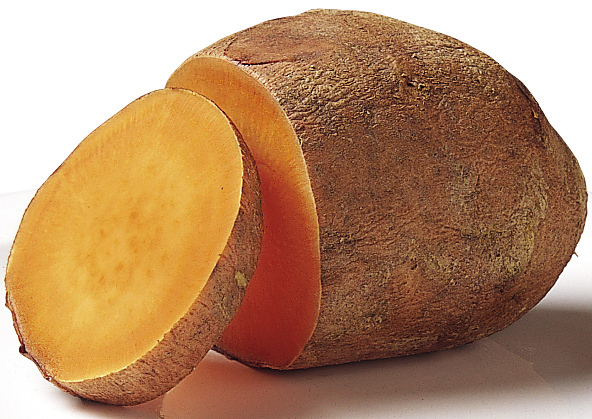 The Rome-based Global Crop Diversity Trust and the International Potato Center (CIP) in Peru are finalizing a US$1 million five-year renewable grant to support, maintain, conserve, and make available sweet potato varieties. 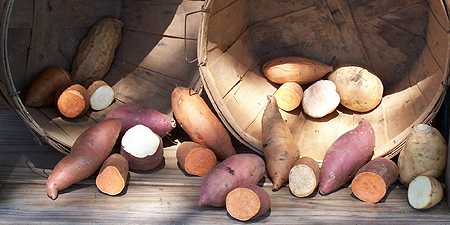 Sweet potatoes grow in marginal conditions, requiring little labor and chemical fertilizers. It is a cheap, nutritious solution for developing countries needing to grow more food on less area for rapidly multiplying populations. “Conserving available farmers’ varieties is urgent for exploitation for traits such as drought tolerance in the face of climate change,” Dr. Robert Mwanga a sweet potato breeder for sub-Saharan Africa at CIP. The orange-fleshed sweet potatoes are a particularly important source of beta-carotene, carbohydrates, fiber, and an inexpensive source of vitamin A. Research shows that just 250 grams of the orange-fleshed sweet potatoes can provide the recommended daily requirement for vitamin A. This is particularly important in sub-Saharan Africa and Asia, where Vitamin A deficiency is a leading cause of blindness and premature death among pregnant women and children under five. With its cocktail of benefits – especially for women and children, who are most vulnerable to malnutrition, disease and hunger – it is important to initiate projects to enhance farmers’ uptake and adoption of orange fleshed sweet potato technologies. Varieties exist with a wide range of skin and flesh color, from white to yellow-orange to deep purple-fleshed roots. The various colours are a rich source of Anthocyanins, which are compounds that have medicinal value as Anti-oxidants and Cancer Preventing Agents. Patrick Makoha, the Secretary for Siwongo Drainage and Irrigation Self-help Group, Busia, Kenya started multiplying orange fleshed sweet potato vines from less than a quarter acre, which have expanded to seven acres in three years. He earns US$ 293.5 a month from the sale of the potatoes and US$ 195.7 monthly from the sale of vines. Multiplication and distribution of clean planting materials or vines has many levels. It involves individual farmers, farmer groups that manage secondary multiplication sites, national agricultural research institutes, and supply-side partners such as extension and non-governmental organization staff that do the monitoring. So far, about 10,000 farmers across the five countries- Ethiopia, Kenya, Tanzania, Rwanda and Uganda- have been reached by the project with planting materials and training on the technologies. In Rwanda, the nutritional value of the orange-fleshed sweet potato has gotten non-governmental organizations working with people living with HIV/AIDS to urge their clients to grow and consume this vegetable. We are almost there! The resolution was adopted by consensus at the Third Committee of the UN General Assembly and will go to the full Assembly for adoption the week of December 19th. Research has shown that simply being born a girl can leave a child at a huge disadvantage in life. In the poorest societies, a girl faces greater risk of malnutrition, hunger, and disease compared to her brothers. She will have fewer opportunities for an education and career. In many developing countries 1 out of 7 girls marries before age 15, resulting in them having to drop out of school before they have a chance to receive the education they deserve. Girls themselves first raised the crucial issue of the need to recognize their rights at a UN gender summit in 2009. Since then girls have lobbied for this day, with the support and guidance of Plan. This idea was reinforced through the amazing ‘Because I am a Girl’ Plan campaign (http://becauseiamagirl.ca/). (http://plan-international.org/girls/resources/girls-in-the-global-economy-2009.php) as well as through the work done by OXFAM for whom ending global poverty begins with women’s rights (http://www.oxfam.ca/). The tranquil revolution is underway! 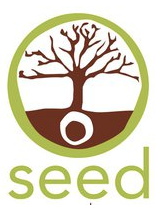 Schools Environmental Education and Development (SEED) is a non-profit organization based in Cape Town that creates learning gardens as part of their Organic Classroom Program, in partnerships with schools in South Africa’s poorest communities. Founded in 2002, SEED trains teachers to design, plant, and nurture a garden according to permaculture principles (http://en.wikipedia.org/wiki/Permaculture), which encourage a sustainable approach to agriculture modelled after an ecosystem. Teachers are using organic vegetable gardens to help children learn about science, geography, health, and economics—and to unlearn hunger. Produce from the gardens is used in the school’s cafeteria or sent home in parcels with the students for their families. Greenpop is working in an environment similar to the Chorkor community, where homes are crammed next to one another, the earth is more sand than soil, and strong winds often blow. This organization is a tree-planting social enterprise that is beautifying these areas, starting with the schools. They start with hardier indigenous trees and if they survive, they come back with fruit trees that can produce 20-100 kg of fruits each in a season, helping to increase food diversity. Children are assigned a tree to look after and must each bring in 2L (1 gal) of gray water—recycled from the bath or sink—to water their tree every 2 days. It is gaining attention from media and corporate sponsors for its gung-ho attitude toward mobilizing volunteers for tree-planting days—largely from among Cape Town’s privileged youth. They also partner with larger companies that can tick their corporate social responsibility box when their employees get involved in tree-planting initiatives. As announced this year by the UN, non-communicable diseases (NCDs) such as cancer, diabetes, cardiovascular disease, and hypertension are largely “forgotten” issue in developing countries. These countries show a higher prevalence of such ailments when compared to developed countries (80% of cases are in the developing world). Experts say that this will be the epidemic facing developing nations in the 21st century, greater than HIV in the 20th century, if trends are not combated in the near future. In their feature, the BBC World Service program talks about the Botswana initiative to show the reality of NCDs in the developing world and the proactive action plan being put in place by schools to reverse the current trends. The aim is to increase awareness in children and youth about the importance of healthy eating, active lifestyle, and health benefit of specific foods. Scientists have discovered that upon introducing African families to the orange sweet potatoes, as an alternative to the white or pale yellow sweet potato typically grown in Africa, Vitamin A intake in women and children doubled. Vitamin A is essential in preventing blindness and supporting the immune system. A deficiency of this essential nutrient is very prevalent in Africa, causing many children to go blind prior to starting school, as well as increasing their susceptibility to diarrhea and respiratory illnesses. These are just some of the key points highlighted in this short presentation. Our organization, Cki is taking part in the youth awareness movement with its project in Ghana where we have set up a school garden club. The children are already growing a large variety of vegetable and we will soon start an education program on the importance of food diversity, good nutrition, and healthy lifestyle.